It was a particularly warm day in the Roaring Fork Valley on Tax Day April 15, 2008. Nothing was planned for my day except some finish work on a weekly photo package for The Aspen Times. As I headed into my job as the Chief Photographer, I started my Jeep, turned on my scanners, and began listening to firefighters concerned about a grass fire near Carbondale 25 miles away. As I drove to the newspaper about a mile from my apartment, the Incident Commander requested mutual aid from all available fire departments. I called the paper and talked with managing editor Bob Ward. He said we should wait to hear how big it gets. I explained firefighters don’t usually ask for help unless it’s out of control. He agreed but wanted to wait. I then called our down-valley reporter and good friend Scott Condon. He was also listening to the scanner chatter. He said he could see a lot of smoke. I told him I’ll be there in 20 minutes to pick him up. Taking the initiative, I drove past work and towards Carbondale where the fire was growing. After I left Aspen, and could see further past the ridge lines, the smoke had risen above the surrounding mountains. It was thick and brown. I called back Bob and told him I was going to pick up Scott and we were going to cover the fire. I also added that there were only a handful of photos that needed to be worked for the weekly. He agreed. As I approached the town of Basalt, the smoke was thick, turning black at times, and filled the sky. I stopped at Scott’s house and he was on the phone with our daily editor Rick Carrol. They were talking coverage of the fire. The wind had kicked up and now the fire had grown to several hundred acres threatening many homes. The chatter on the scanner increased as more firefighters arrived asking where they need to go. State Patrol as well as local law enforcement began blocking roads, yet they had not yet stopped traffic on the main thoroughfare of the valley: Highway 82. Scott got in my jeep and we headed down 82 towards the fire. We turned into a subdivision call the Ranch at Roaring Fork. An established neighborhood with many families, but in the direct path of the flames. As we were driving around, most people were just watching the smoke rise into the sky. Some I think were in shock. We began knocking on doors warning people and many just stood looking at the encroaching flames. As I got into my Jeep, and Scott was not far behind, I saw flames explode behind this house. I began shooting pictures. I captured about a dozen frames before I could feel the heat and we took off north on 82. My heart was pounding so hard it felt like it would explode out of my chest. Not only was I in the thick of a major wildfire, I also had to make sure Scott and others were safe. Cars continued to drive past the wildfire although flames were shooting up past the Jersey barriers. A woman screams her house was burning, she walked towards me with her hands in her head. Then I noticed two fishermen climbing over the barriers. I ran to them shooting pictures, then one said “Be careful of his arm, he’s pretty badly burnt.” I looked down to see his skin falling off his arm. We pulled him up, walked him down to the relative safety of the median, and called 911 for an ambulance. We wrapped him in a blanket, sat him in the truck as he went into shock. His name is Larry Garfinkle of Thousand Oaks, Calif., and was on a fishing vacation with several friends. The wildfire caught them off guard and as they were escaping, the flames overtook him burning his left arm, back, and head. He survived and needed several grafts to help him heal. As the day progressed, we made it back to incident command. I used my laptop to tone a few photos, and then connected my phone via bluetooth. I transferred a few low res photos to my phone so I can text them to the web editor. We did not leave the area as we did not want to lose the access we had. All roads were closed several miles in every direction, in effect, halting traffic in the valley. The fire started as a trash fire several days earlier. The landowner had thought he extinguished the flames. But the recent lack of moisture kept the coals hot and when the wind picked up, they fanned the coals lighting nearby grasses on fire. These then caught the dry shrubs and eventually dry cottonwoods. Over one thousand acres burned in less than 8 hours. By night-time, the fire was out and crews were monitoring hot spots. Amazingly, there was only minor damage to a handful of homes, and only the one injury. 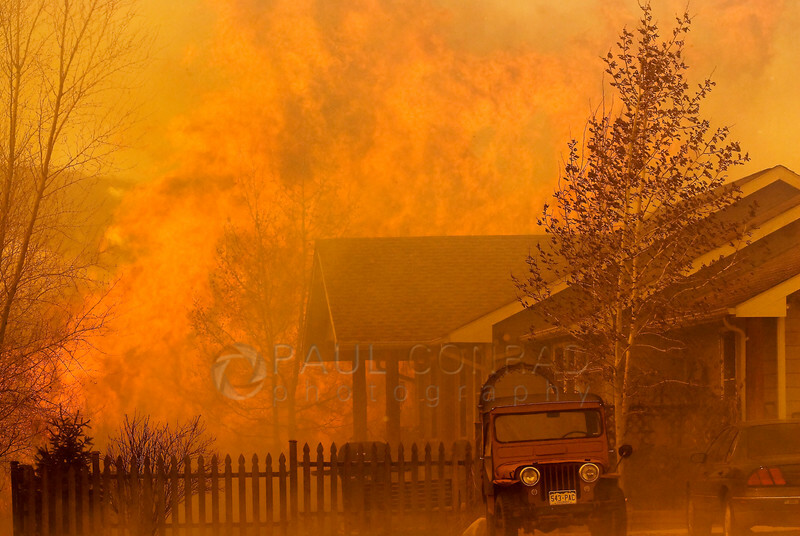 For more images of the wildfire from that day, visit the gallery A Day in Hell: Wildfire in Carbondale, Colo.
Paul Conrad is a talented and skilled award-winning photographer living in Bellingham north of Seattle, WA, in the Pacific Northwest. His work has been published in newspapers and magazines throughout the United States and in Europe. He is available for assignments anywhere in the Pacific Northwest. Although his specialty is photojournalism covering news, sports, and editorial portraits, he also is skilled in family portraiture, high school senior portraits, and weddings.